The Spokane City Council has chosen its top five of the 22 applicants for the seat vacated by former Councilman Steve Salvatori last month. They are: Adrian Dominguez, Julie Griffith, Karen Stratton, EJ Iannelli and Kitty Klitzke. The seat represents council District 3, which covers northwest Spokane. Councilmembers sent their top choices to Council President Ben Stuckart Friday and those suggested by the most councilmembers will be interviewed publicly by the entire council on Aug. 13, 12:30-2 pm, in the Briefing Center in the lower level of City Hall. The council will vote to select one candidate Aug. 18. Salvatori was well-known for being a business-friendly conservative, and some have called for the council to replace him with another conservative, even though the council is now dominated by a left-leaning majority. However, conservatives look likely to be disappointed. 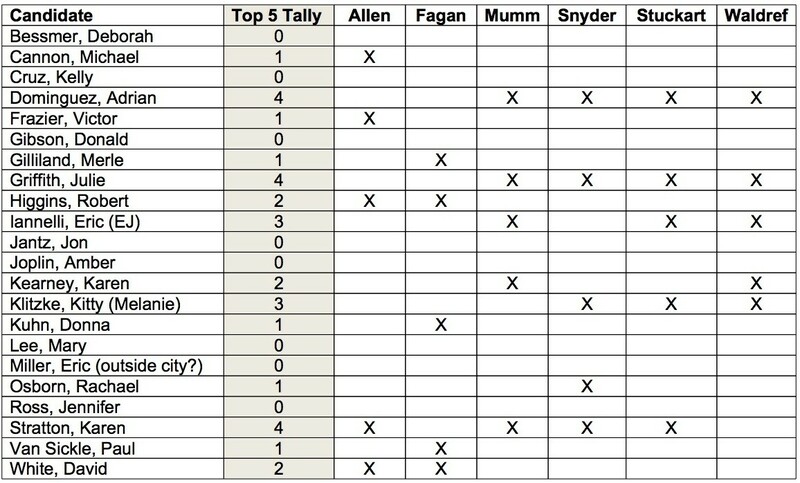 Just one of the five finalists was suggested by Councilman Mike Allen, one of the council's two remaining conservatives, and none of them were recommended by Councilman Mike Fagan. Here's a little more about each of the finalists. Find their full applications at the bottom of this post. Adrian Dominguez is an epidemiologist at the Spokane Regional Health District and an adjunct professor at Eastern Washington University. He has degrees from the University of California and completed a fellowship at Harvard in 1987, according to his résumé. (If Dominguez's name sounds familiar, it may be because he was also recently selected to be a member of the city's newly formed Office of Police Ombudsman Commission. He told the Spokesman he'll take the city council job if offered.) From his application: "We need to address the disparities and inequities that are prevalent in our community. My professional career in Spokane has allowed me to explore and assess the life expectancy for all neighborhoods in our county. Within the City of Spokane, an 18 year gap of life expectancy exists between the most affluent and poorest neighborhoods. I was outraged when I identified this gap. I thought to myself that this should not be the case for a place I call home. I expect and want all citizens in every neighborhood to have the same opportunities and resources that result in success. As a member of our community and as a member of City Council, I will strive for policy that will positively impact all members of our community and move our residents toward healthier lives by engaging the partnerships I have developed, which include, community partners, businesses, universities, legislators, community members and public health." Julie Griffith is a director at the financial counseling company Money Management International. She previously worked at the nonprofit Community-Minded Enterprises and taught high school in the 1990s, according to her résumé. Her application, provided by the city, does not include her answers to the supplemental questions on the application. But one of her letters of recommendation includes this: "In that she is financially conservative, supports social services — where funding is available, (sic) is for business and is committed to building community makes her an ideal candidate for the Spokane City Council and an excellent representative for the people of the 3rd district." Karen Stratton is currently a clerk in Spokane's Office of the City Clerk and worked as a senior executive assistance to former Mayor Mary Verner and senior advisor to former Mayor Jim West, according to her résumé. From her application: "I have worked with Spokane's business leaders, and neighborhood groups, and have the civic history to understand the perspective of each." E.J. Iannelli is chair of the Emerson Garfield Neighborhood Council and an Inlander contributor. He has also held positions with the boards of Main Market, the West Central Community Center and Project Hope, according to his application. From his application: "...along with sound day-to-day operational and budgetary oversight, I would like to play a role in legislative decision-making that balances practicality and vision, that realizes the innate potential of Spokane without compromising its distinctive character, and that remains focused on the long-term needs of the many over the short-term desires of a few." Kitty Klitzke is the eastern Washington program director at Futurewise, a growth management advocacy group that has clashed repeatedly with the county over land-use issues. She sits on local transportation advisory committees and previously worked for the Lands Council, according to her résumé. (Klitzke is also married to Rick Eichstaedt, executive director of the Center for Justice.) From her application: "I enjoy my current work on land use and transportation but since becoming a new mother I am interested in working on a broader range of issues to make my daughter's home town a better place to live ... I have learned that frankness, open mindedness, inclusiveness and follow through can achieve long term goals and maintain positive relationships with and between people of diverse backgrounds and opinions. This is how I get things done, and I hope to learn to do even more as a council member."